There’s a saying that goes: “Always aim for the moon. Even if you miss, you'll land among the stars.” And so it is for Sonic Lost World, which clearly sets out to be Super Mario Galaxy 3: Hedgehog Edition. It’s so much like Miyamoto’s opus, it would be no surprise if it turned out it’s running on Galaxy’s game engine. It sure looks like it. And while the net result falls visibly short of the standard set by the two best 3D platformers ever made, hear this: Just for once, Sonic’s in the same ballpark. And that deserves attention. The majority of Lost World’s stages are 3D and look like a sped-up, wall-running version of Mario. There’s the same spherical gravity effect, similar colour palette and a familiar overall feel. Sonic’s movement is more assured than it’s ever been in 3D, and the usual frustration of ‘death from falling off’ is often solved by the simple fact you can’t fall off a sphere. Fans will be pleased to hear that, for all the similarities to Mario, this is the most authentically Sonic-feeling 3D outing yet, embracing the same fundamental design choices that made the original 16-bit games so appealing. The art style is bold and colourful, yet simple enough, leaving the level design to take the spotlight instead of miles and miles of naturalistic scenery. This Sonic game isn’t face-meltingly fast, meaning you can actually see danger coming up and react to it in time. "This is the most authentically Sonic-feeling 3D outing yet." Sonic’s new moveset includes wall-running, wall-boosting, lock-on grabs, combo attacks and a three-bounce high jump. They take time to adapt to but also allow unprecedented, precise control over Sonic. The new controls don’t just modernise environmental traversal--they also provide a distinct safety net, allowing you to save yourself in dire situations with a quick double jump or ledge grab. While control in 3D is better for these augmentations, the more complex 2D levels can be tricky. With so many rules for how Sonic reacts contextually to his environment, it can be hard to predict exactly how he’s going to move at all. Especially when the command for double-jump is the same as the homing attack; trying to jump higher over a spiky enemy can be interpreted as ‘impale Sonic on the spiky enemy’. "The result is a super-fast character that can also tackle slow, deliberate platforming." The Color abilities from Sonic Colors (and Generations) make a token appearance, allowing you to change Sonic into a rocket, drill or small galactic phenomenon (yes, really) for a brief time, although their inclusion only dilutes the gameplay and comes across as an afterthought. They’re indicative of Lost World’s slight tendency to overcomplicate things for variety’s sake, and while Super Mario Galaxy never unintentionally confuses the player, the same can’t be said here. Exploration, however, is a key element and levels are packed with hidden routes. There are always five red tokens to find, plus a ranked Time Attack to master once you’ve finished a level once. Unlike the 3DS version, regular levels aren't graded, but there are hours of play needed on some stages to nail an S-rank speed run. As a result, the 6-7 hour main game could keep you going for months if you want to see and do everything. Special stages in Sonic games are among the most anticipated features of these games, but they’re essentially absent here. Instead, collecting the red tokens unlocks Circus events, where Sonic and Tails bounce on a touch-screen trampoline and free animals from balloons. It’s a pretty little Breakout clone, but it’s ruined by the special effects getting too busy. You can’t play the game properly when you can’t even see your character. Character is one thing the new enemies (known as The Deadly Six) have plenty of, with fun, stereotypical personalities like punk, emo and glamour girl. Oh, and Yoda. The old one is clearly Yoda. What a disappointment, then, that the story itself is wafer-thin and the dialogue is mostly awful. It doesn’t affect the gameplay (and you can skip cut-scenes), but there’s little sense of any narrative crescendo, to the point where you probably won’t even realise you’re on the last boss until it’s all over and the credits roll. "Sonic Lost World feels like a Sonic game, works like a Mario game, and feels totally at home on the Wii U." Perhaps the biggest fly stuck in the icing on this otherwise delicious cake is the lives system. Hit Game Over and you have to start the level again from the beginning, with four new lives. The traditional quota has always been three, so you’d be right to guess difficulty is an issue here. And it really is. Later levels are exceptionally hard. Not necessarily unfair, just incredibly difficult. The game does offer a ‘quick skip’ item if you fail one section three times, but then you’re only left with one life for the next section. So is this deliberate old-school challenge? Doubtful. If you just go back to the first Tropical level, its final area lets you hit a restart point, pick up eight extra lives in the clouds, then fall off and do it all again. Life-grinding another 50 spare Sonics just to get through the crazy-tough 2D rail sections is ridiculous, but you’ll do it. Because otherwise, you’ll go insane. When laid out like this, it would appear this is yet another Sonic game full of problems and frustrations, but that really isn’t the case. 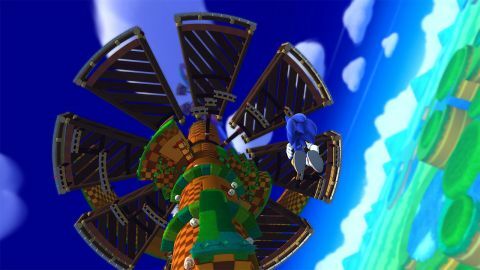 Fact is, the majority of levels in Sonic Lost World are an absolute joy to play, several of them easily as good as the best that Mario Galaxy has to offer. The sheer creativity and quality on show is a glimpse of the Sonic Team we used to know and love, and it’s very refreshing to see. Sonic Lost World feels like a Sonic game, works like a Mario game, and feels totally at home on the Wii U as a result. With the most convincing 3D Sonic gameplay by some margin, it’ll no doubt be looked back on as the game that aimed for the Galaxy, missed by a small amount, but still landed in the stars. Description SEGA's upcoming Sonic the Hedgehog title exclusive for the Nintendo Wii U and 3DS.